sOMEThING - Improved Performance Through Bi-Metal Design! sOMEThING is back with an all new bi-metal design that will blow you away! The Phaser! 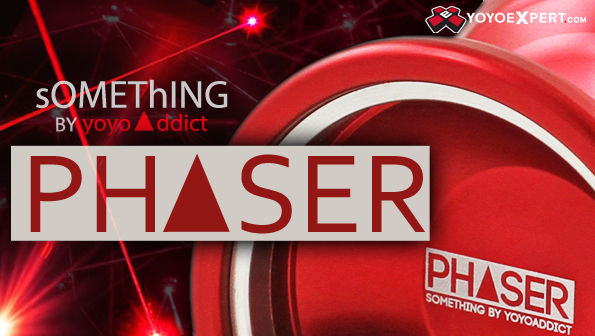 The Phaser shape was based on the popular Superfly Remix from sOMEThING, in fact it is almost identical. They only made one minor change, but it changes the yo-yo in a big way - They added a stainless steel weight ring inside the rim that really takes the Phaser to a whole new level! sOMEThING kept the same dimensions as the Superfly Remix, even the same weight, but it is far from the same yo-yo! With the addition of the stainless steel weight rings, sOMEThING was able to give the Phaser a completely different feel. It is just as fast and maneuverable as the Superfly Remix, but the Phaser has an even more stable and solid feel on the string and through long combos. The Phaser is a serious competitor and if you're having any second thoughts about it just take a look at world champion Hajime Miura's recent freestyles. He used the Phaser to win the 3A division at the 2014 World Yo-Yo Contest and AP2014!